Ewan’s most significant commission was to draw 12 heritage trees for the Royal Botanic Gardens, Kew, to celebrate the Year of the Tree. Also, Ewan has been asked to draw a number of trees as memorials and for specific projects, including churches, an Oxford College, a Wildlife Trust, an arboretum and a book. 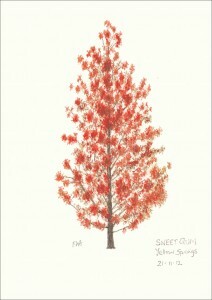 Ewan has drawn a number of memorial trees, and pictures have been exhibited at the National Memorial Arboretum. These may be a favourite tree or a record of a particular tree or a drawing of a tree near the grave of a relative or friend. Ewan welcomes enquiries about the drawing of memorial trees and is pleased to accept commissions, please contact him to discuss details.